There are currently none of this item in your Cart. What more heartfelt way to express your sorrow than with this fireside basket filled with flowers? 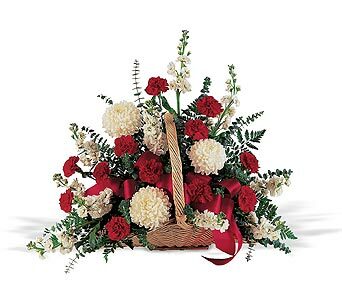 One arrangement with red carnations, white chrysanthemums and stock, along with eucalyptus and fern, is delivered in a willow fireside basket. Page loaded in 0.5318 seconds.